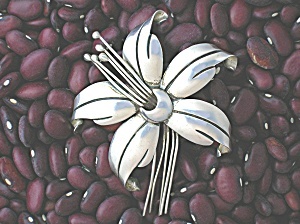 Beautiful and Signed Sterling Silver Tasco Flower brooch. The Brooch has marks in 3 places on the back. Sterling, Hecheon Mexico Maricela in Script, and 925. The brooch is 2 inches wide and 2 1/2 inches long. The Flower looks like a hibiscus, and it is very pretty.